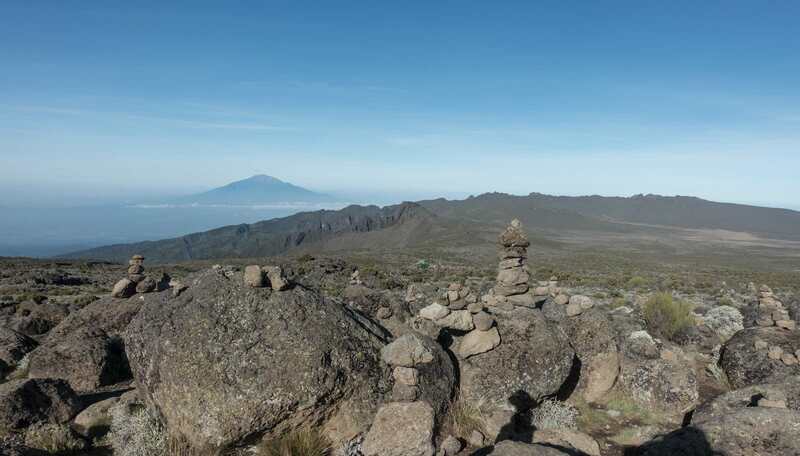 Shortly into the day’s walk, I turned around to the west for the day’s view of Meru. For sure the others I was hiking with did not have the emotional connection I did with the bump on the horizon. 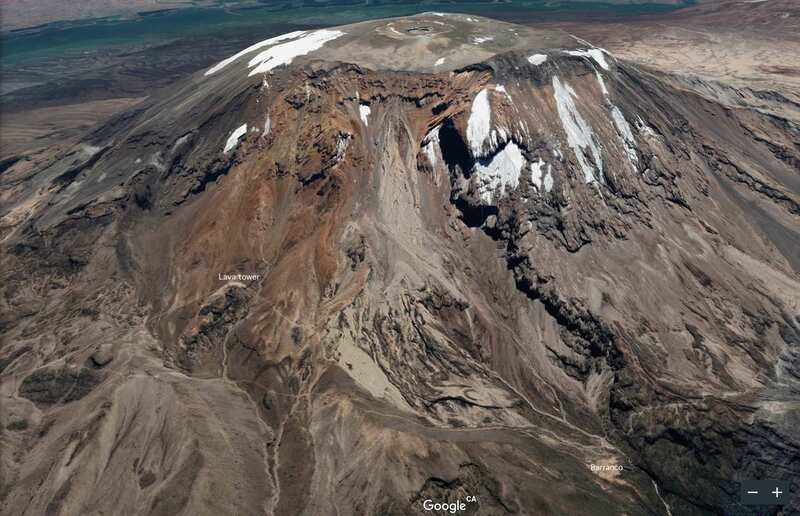 The three days I had spent summiting it the week before meant I was looking at an old friend! As I zoomed into Meru’s profile, I could make out the little bump on the right, that of Little Meru. 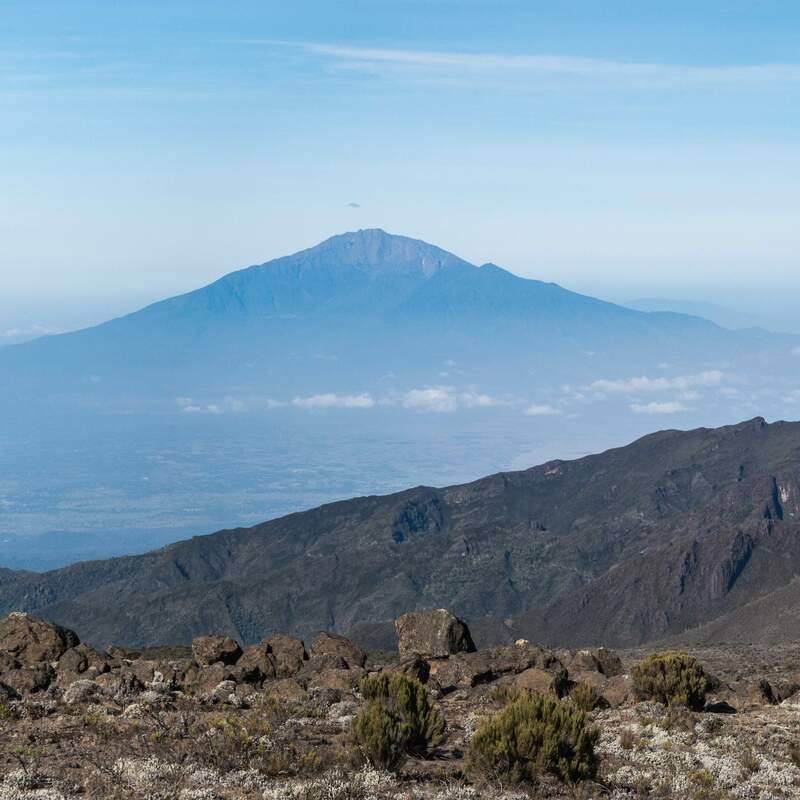 We had spent an hour on a beautiful sunny day sitting up there and looking east to Kilimanjaro and up towards the summit we would be doing a few hours later. 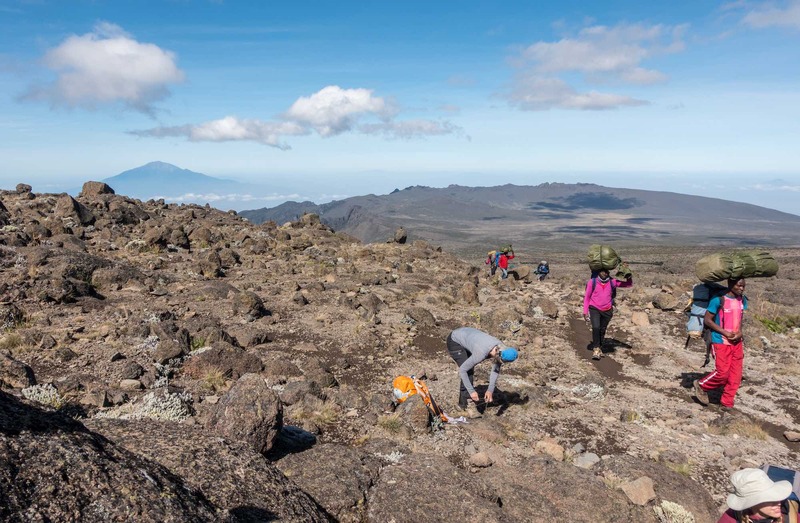 Our walk on the Shira plateau was coming to an end but not before a morning’s worth of gentle uphill to Lava Tower, where we would have lunch. 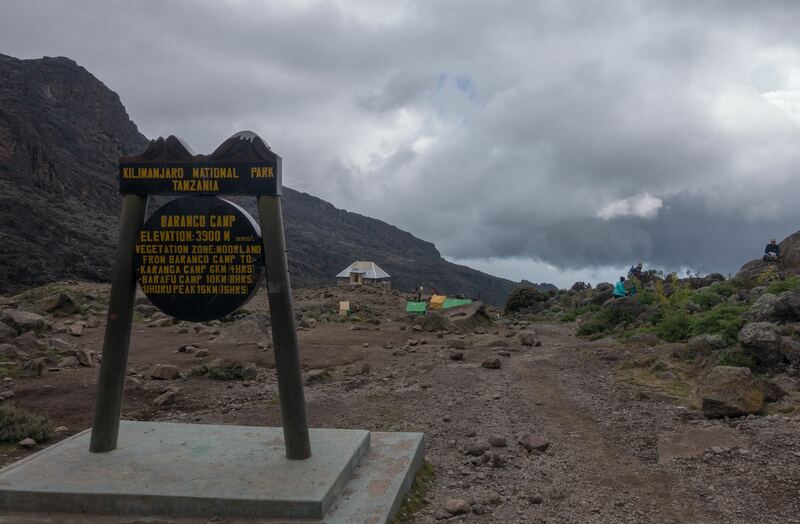 Along the way, our trail would merge with the one from the Machame Route and the relative solitude we had experienced for the first three days would be replaced by the increased traffic of trekkers and guides and porters. 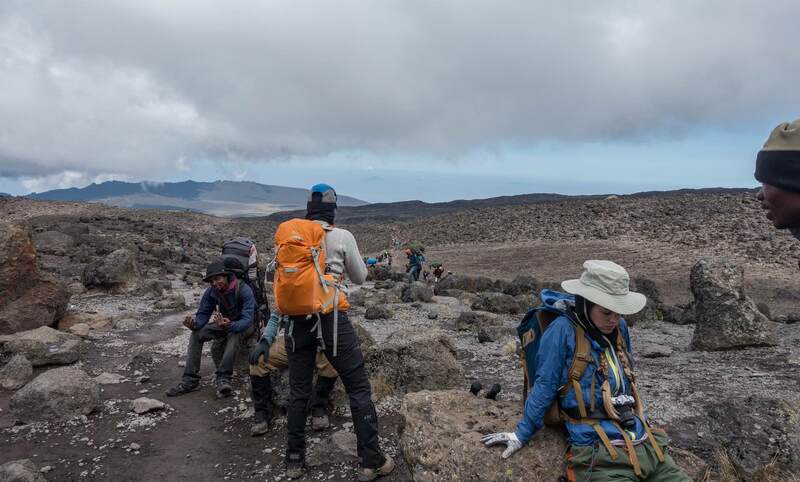 Spending time at Lava Tower makes for an excellent acclimatization exercise. It is 700 meters higher than Shira 2 camp. As the images above and below make clear, we were definitely in the alpine desert zone now. If anything was growing it was probably lichen! 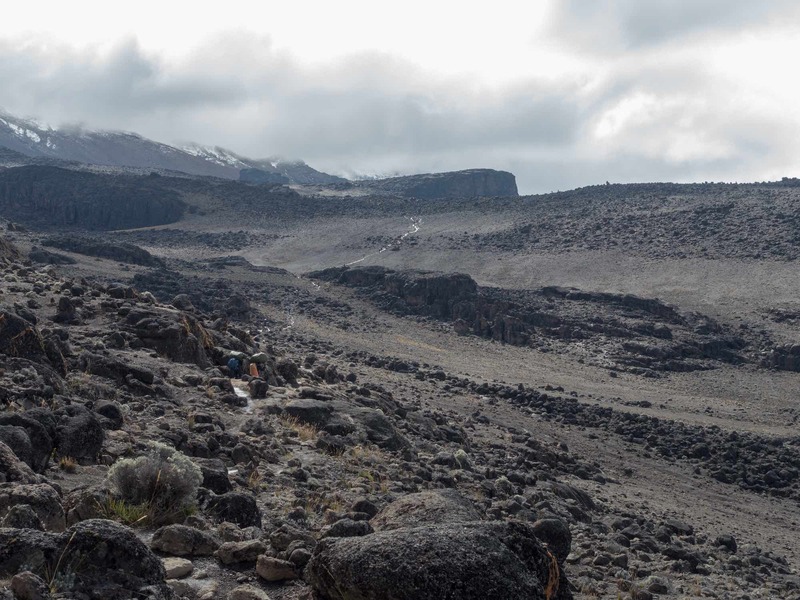 Just behind the Lava Tower is a flat plateau; some groups actually use it as one of their campsites. When we got there a number of tents were up. Amazingly, those included a couple of our Popote tents! 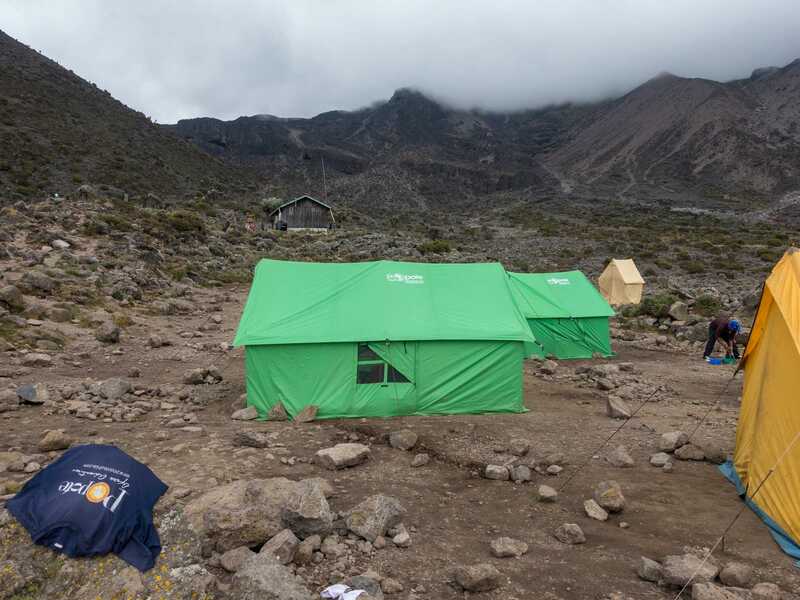 Our support team had walked ahead of us and set up the cook tent and the dining tent. When we arrived, tea and munchies were sitting on the table ready for us! 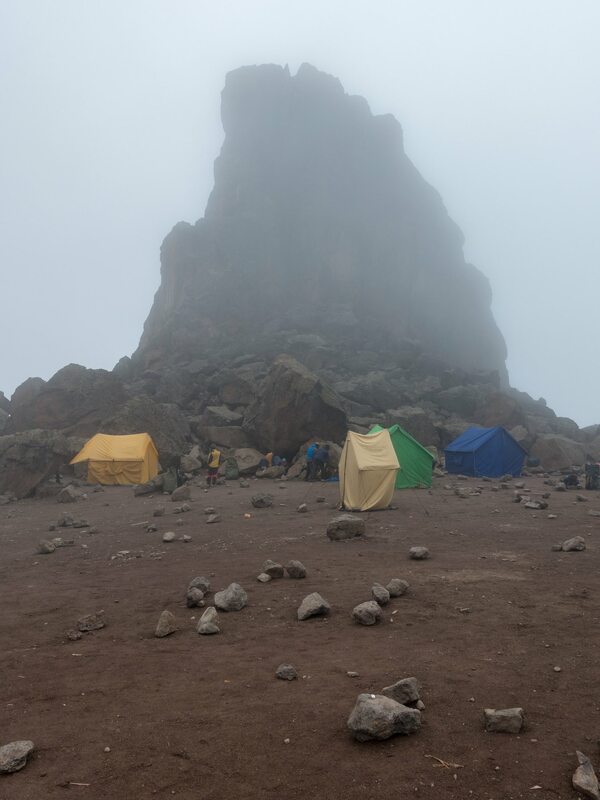 We spent a bit over an hour up behind lava Tower in our dining tent. It was somewhat fogged in and damp but sitting in the tent provided some warmth and shelter from the wind. Having gained 700 meters of altitude in the morning, we were about to lose it all in the afternoon! 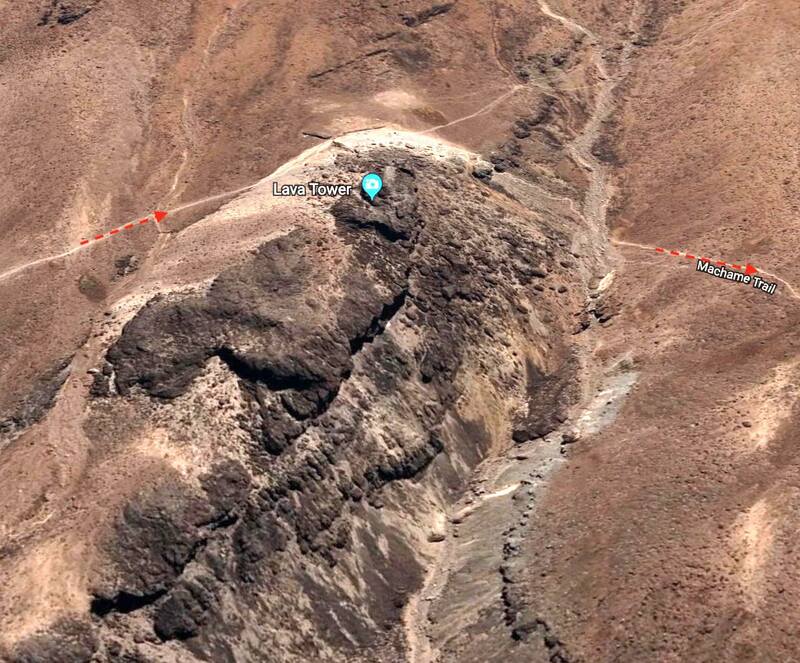 The satellite image below shows the trail from Lava Tower down to Barranco Camp. 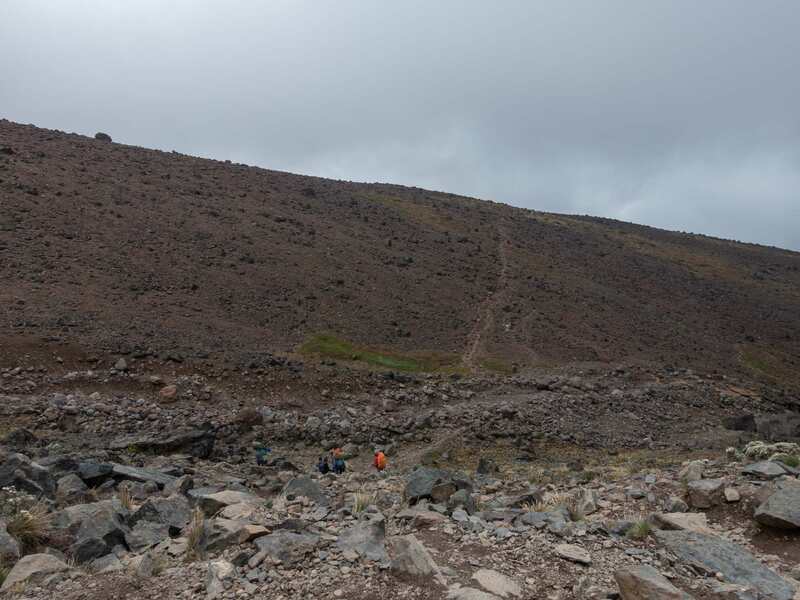 Our afternoon walk started with a steep downhill to the bottom of the gully – a mini-version of the much larger ravine above which our next camp would be located. When I asked Dixon where the word Barranco came from he told me it was the Spanish word “ravine”. 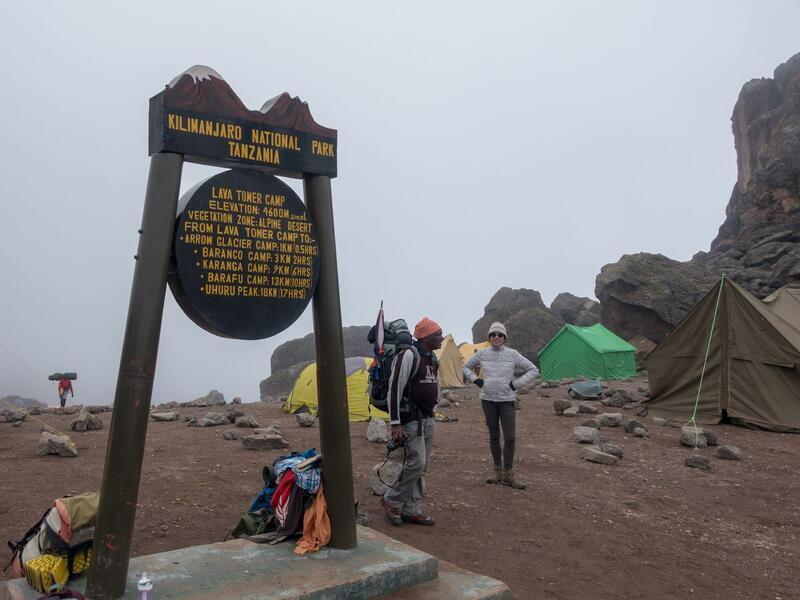 It did leave me wondering how a Spanish word got stuck to the side of Kilimanjaro – but then, given words like Kosovo Camp and Rebmann Glacier and Fischer Campsite, it is yet more evidence of Kilimanjaro’s global reach. 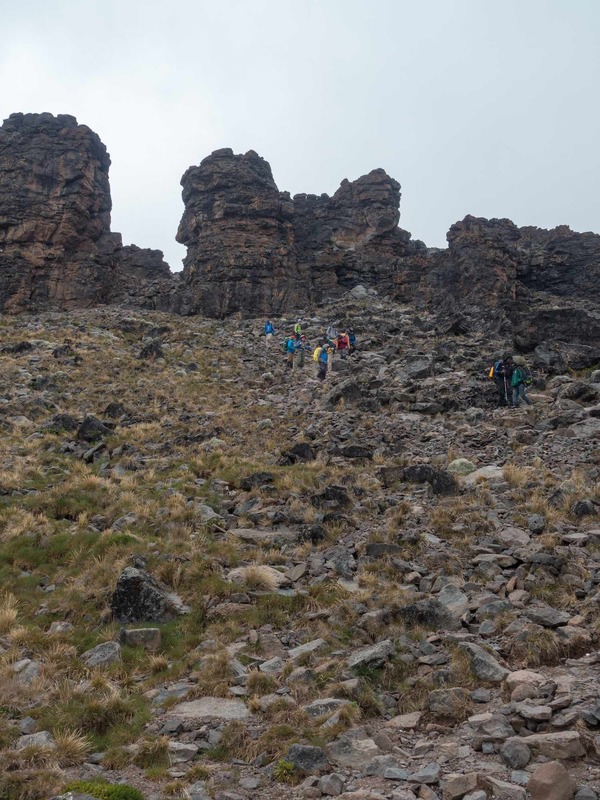 A steep eighty-meter drop from Lava Tower – as in the image above – and then it was up the other side of the gully to the top of the ridge – as illustrated in the following two images. 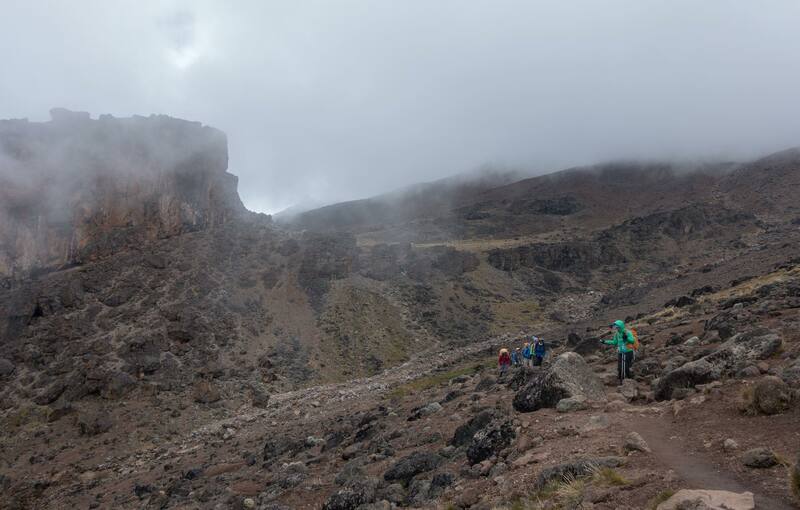 Once we got to the top of the ridge – see the image above – it was downhill all the way to our cam for the night, Barranco. I lengthened my trekking poles a few inches for extra stability and let gravity do its thing as I went down at a faster pace than usual. 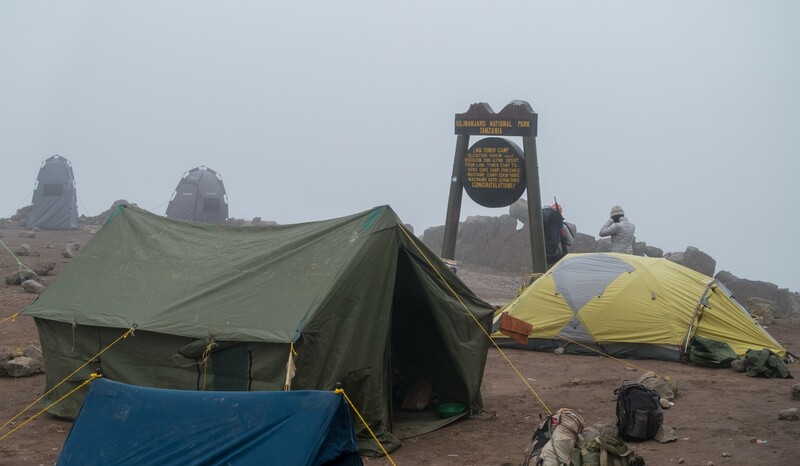 forty-five minutes later I got my first view of the campsite at 3986m/13,077ft. We were now 147 meters/482 feet higher than we had been at Shira 2 Camp at the start of the day. 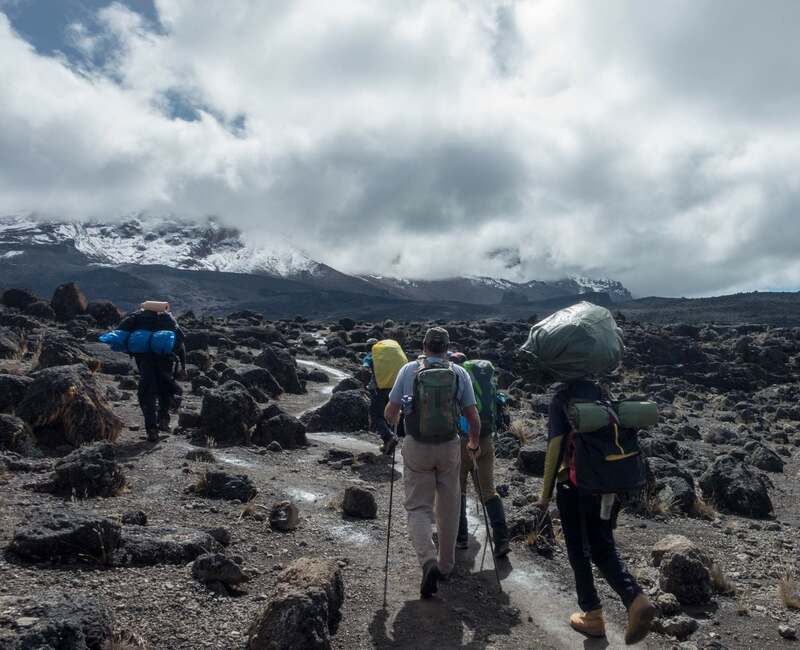 We had also gained some valuable acclimatization time. 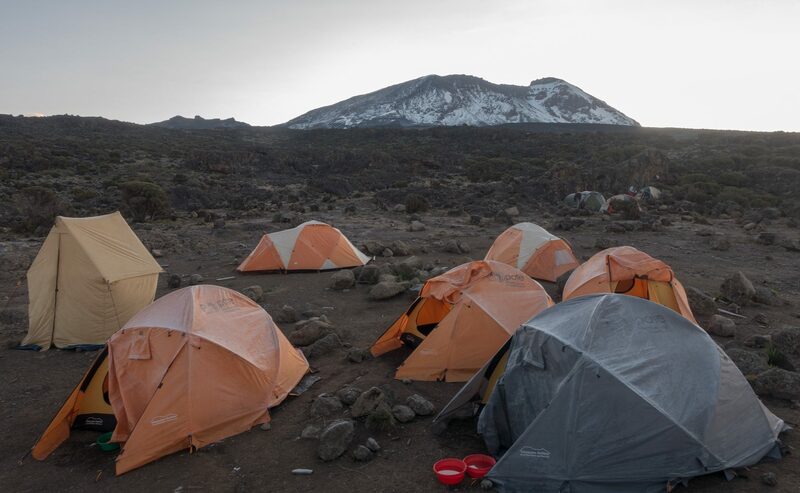 The campsites on the first three days of the Lemosho Route were all but empty. 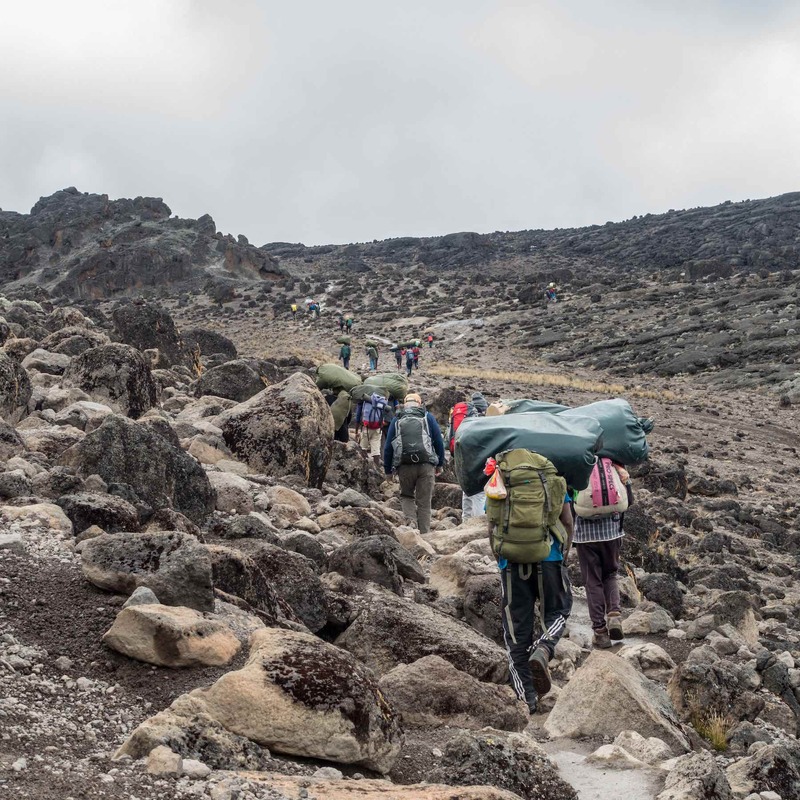 Now that our route had merged with the Machame route, it would be much busier all the way to the summit. 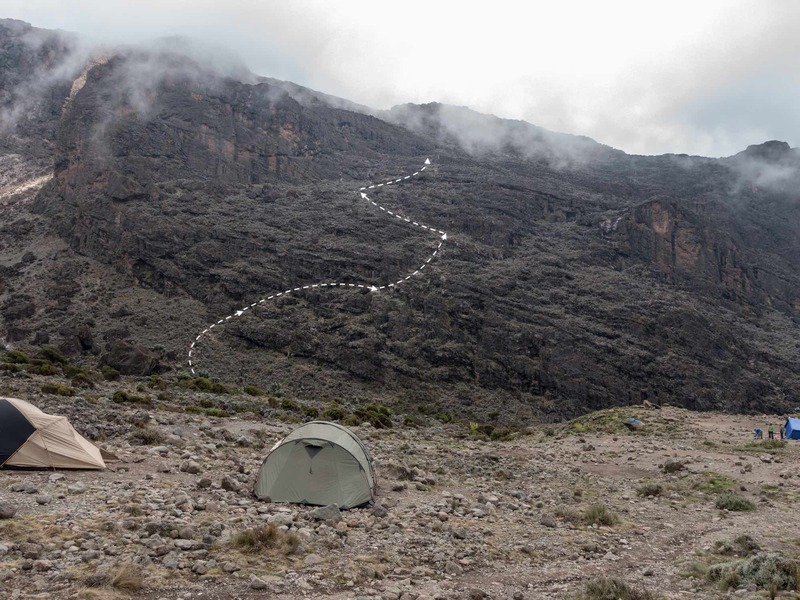 We had some time to contemplate the next day’s big event, the scamper up the Barranco Wall, aka “The Breakfast Wall” since it is the first objective after leaving camp. The “Wall” is essentially the other side of the ravine. From our campsite, it looked somewhat intimidating. We wouldn’t have to wait very long to find out! 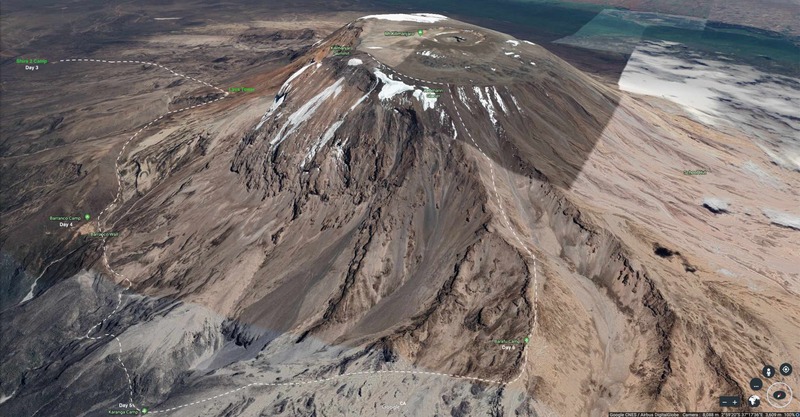 The satellite image above shows the southern slopes of Kilimanjaro above Barranco. 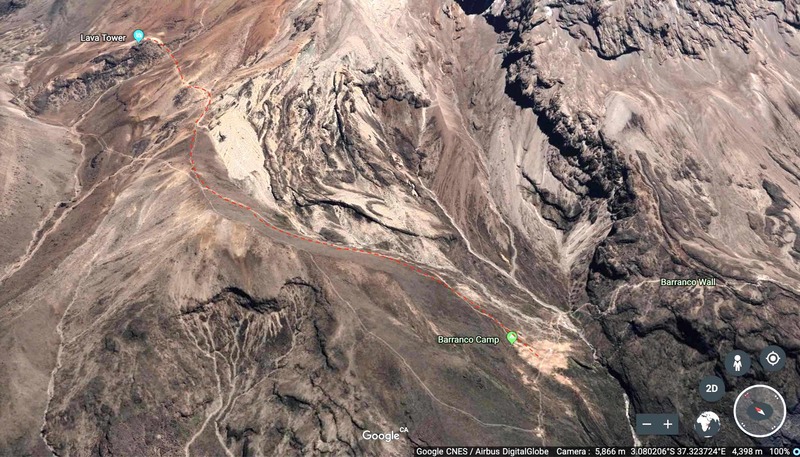 Apparently 100,000 years ago a massive piece of the upper section of the mountain came sliding down the slopes and created the ravine – the Barranco – we now see.